September 22, 2009 was our eighth anniversary. At the time we were attending the National Education Conference in Goroka, not far from the SIL headquarters in Ukarumpa. We were there with five others from SIL so it was not a quiet, romantic get-away for us. That night we went out for pizza at a local hotel, which we all enjoyed. While at the conference we were able see a number of different groups perform traditional dance with their colorful costumes. As we arrived Gertrude was saying that she may not know anyone there. It turns out that the lady who is the head of the Education Department of Goroka University was a friend from Kavieng who I met in 2003. After the conference we flew down to Port Moresby. We planned a couple of days there before continuing on to Milne Bay. This gave us time to visit with a friend of Gertrude’s named Rachel. 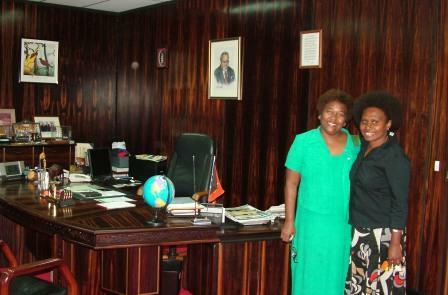 She is the personal assistant to the Prime Minister Michael Somare. We were able to visit Rachel in her office and she took us into the Office of the Prime Minister to show us around. The P. M. was away at international meetings in NYC so we did not get to meet him. I was a little disappointed with the traveling that we were doing this week that I was not able to do much in line of celebrating our anniversary. Friday, just after lunch we went to the airport to continue on to Milne Bay. We were there plenty of time before the flight was to depart. After we cleared security to enter the terminal there was a large crowd of people waiting to check in to get their boarding passes. After waiting they finally had the people line up at particular counters for different flights instead of just waiting in the one line. At last we got into the line that we were suppose to be in. After waiting another hour we were up to the counter to check in. What we did not know was that the flight was over booked and there was no room for us. We waited another two hours for them to make sure we were booked on the next flight. Then an hour more in another line where they would issue vouchers for us to stay at a hotel. Then we had another wait for the hotel van to come to pick us up. After a half hour drive we arrived at the Crown Plaza Hotel. It was beautiful. Neither Gertrude or I could believe the wonderful accommodations that were given to us. After we got settled into our room we went downstairs for dinner. The Cafe was full so we waited as I played the piano. After a while I took note of a nicer restaurant. I thought if they would accept the vouchers I would pay the difference for the meal. We had wonderful service to go with a wonderful meal, that was finished with Crape Suzzette. We thank the Lord for the way we could celebrate Eight Years Together. It was totally beyond my means, but that did not hinder what God had planed for us. After all that waiting at the airport, it made for a very special time for us to spend time together, just the two of us.